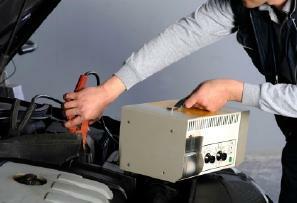 Learning how to jump start a car is vitally important for anyone who drives a vehicle. It never fails that on the day you have limited time, your car will fail to start. A dead battery can occur for many reasons, but when you jump the vehicle, it takes only minutes to get things back on track. Jump starting a vehicle is necessary when the battery fails. The battery of any vehicle is charged while the car is running. However, if lights are left on or a door is ajar overnight, this can lead to the battery losing its charge. The battery can also stop working if it is too old. Since the vehicle uses the battery to turn the car's engine on, it is a vital component of a working vehicle. The first step in the jump starting process is to obtain another vehicle, called the "booster" vehicle. Park this car close enough to the car with the dead battery so that the jumper cables can connect the two. Jumper cables should be in good condition, without any exposed wires. The clamps at the end of the cables should be clean and dry. Never allow the jumper cables to dangle into the engine area. Keep the ignition of both vehicles off. The brakes need to be set, and the transmission must be in either park or neutral. Turn off everything possible within the car, such as the radio, lights, and other electric systems. Clamp the jumper cables to the dead car first. You will need to connect a positive jumper cable end to the positive terminal of the dead vehicle. The positive end of the jumper cable is usually colored red and is generally marked as the positive. The positive battery terminal is labeled with a plus sign (+) on the actual battery. The connection needs to be strong. To do this, look at the clamp and ensure the clamp's teeth are biting into the dead car's battery terminal. Reposition it if necessary. If there is any rust or corrosion on the battery, you will need to use steel wool to clean off the terminals. This is the only way to ensure you have an effective connection. Next, move to the booster vehicle, or the car with the live battery. Connect the positive end of the jumper cables to the positive battery terminal on this car. Follow the same procedure to determine which are positive terminals and cables. Then connect the negative cable to the negative battery terminal on the booster car. The negative jumper cable is generally black in color. The negative battery terminal has a minus sign (-) on it. Attach the other negative cable to any unpainted metal surface on the engine of the dead car. Do not attach to the battery. Choose a bolt or bracket that is unpainted and as far from the dead battery as possible. Check each of these cables again, to ensure a tight fit. Then start the booster car. Allow the vehicle to idle for five to six minutes, unless the battery was dead for an extended period. In that situation, allow the car to idle for ten to 15 minutes.Start up the dead vehicle after that time, and allow both cars to run for several minutes. If the dead vehicle still does not start, do not keep trying to jump the car, as this could damage the starter. Your vehicle may have additional problems and might need to be started by a professional. Once the vehicle is running, you can disconnect the jumper cables in the reverse order of how you placed them on the cars. Do not shut off the engine of the dead car, but drive it somewhere for a few minutes to give it a chance to fully charge. Once you know how to jump start a car, you'll find you not only have a useful skill, but peace of mind as well.